Formal verse is the name given to rhymed poetry that uses a strict meter (a regular pattern of stressed and unstressed syllables). This two-line poem by Emily Dickinson is formal verse because it rhymes and its lines contain the same number of syllables (ten) with the same stress pattern of unstressed and stressed syllables: "In this short Life that only lasts an hour / How much - how little - is within our power." Most poetry that consistently uses rhyme also uses meter, and is therefore formal verse. Formal verse is distinct from blank verse (poetry with meter but no rhyme) and free verse (poetry without meter or rhyme). While formal verse was very popular before the 20th century, it has fallen out of fashion among poets since the 1940s-50s. However, many contemporary songs and nursery rhymes continue to use formal verse. In order to understand formal verse in more depth, it’s helpful to have a strong grasp of a few other literary terms related to poetry. We cover each of these in depth on their own respective pages, but below is a quick overview to help make understanding formal verse easier. Meter: A pattern of stressed and unstressed syllables that defines the rhythm of lines of poetry. Poetic meters are named for the type and number of feet they contain. For example, iambic pentameter is a type of meter that contains five iambs per line (thus the prefix “penta,” which means five). An example of a line of iambic pentameter (with stressed and unstressed syllables highlighted) is "Shall I compare thee to a summer's day?" Although all formal verse poems have some sort of rhyme scheme, certain forms of poetry have a pre-determined rhyme scheme, such as the sonnet or the villanelle. Poets wanting to write such poems have to match the rhyme scheme they use to that defined by the type of poem in question. Line-by-line: Different lines of the poem can use different meters. For example, common meter is a type of meter that alternates lines of iambic tetrameter (four iambs per line) and iambic trimeter (three iambs per line). Within a line: Metric variation can also occur within a line of a poem. For instance, a poem written in an iambic meter may suddenly substitute an iamb with a different foot—for example, a trochee, the iamb's opposite—to create a pause, accommodate a certain word, or vary the poem's rhythm. As long as these substitutions are relatively minor enough that the overall meter remains recognizable, the poem would still be an example of formal verse. In fact, this type of variation is standard in formal verse. Here is a list of some of the most common forms of poetry written in formal verse. Each form has its own specific requirements and conventions (such as a particular rhyme scheme or meter). 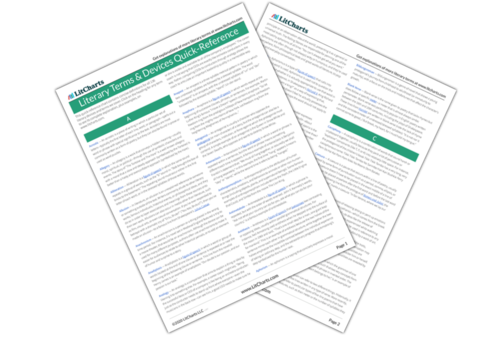 The LitCharts entry for each form also provides more details about its particular features. Note also that not all poems written in formal verse have to fit into one of these categories. As long as a poem uses end rhyme consistently and has a consistent metrical pattern, it counts as formal verse. In the examples that follow, we've bolded the rhyme scheme and highlighted the stressed and unstressed syllables to help you better identify how formal verse is at work in each of the poems. Theodore Roethke's well-known poem "The Waking" (from 1953) is a villanelle in iambic pentameter. This stanza, an excerpt from the longer poem, has a rhyme scheme of ABAA. This poem is a good example of a modern poet using formal verse, which is increasingly uncommon. This is the first stanza of a famous sonnet by Shakespeare. It's written in iambic pentameter (meaning there are ten syllables per line following an "unstressed-stressed" pattern) with an ABAB rhyme scheme. Dickinson's "Because I could not stop for Death"
This poem by Emily Dickinson is written in a common meter—as were the majority of Dickinson's poems— so it alternates between iambic tetrameter and iambic trimeter (that is, lines of eight syllables and six syllables). The poem follows an ABCB rhyme scheme. Dr. Seuss wrote many of his children's books in anapestic tetrameter, a form of meter in which each line has four feet called anapests, with each anapest consisting of two unstressed syllables followed by a stressed syllable—as in the word "Un-der-stand". Here, the beginning of Horton Hears a Who! gives a clear example of the form in an AABB rhyme scheme. This is an example of a use of formal verse that doesn't follow the conventions of any particular form or type of poem, such as the sonnet or villanelle. Notice how, to add variation to the rhythm, Seuss shifted the beginning of the fourth line so that it begins with an iamb rather than an anapest. Why Do Writers Use Formal Verse? To understand why writing in formal verse is such a strong and influential tradition in poetry, it helps to understand the uses of meter and rhyme more generally. Metered verse has its origins in ancient Greek and Roman epic poetry. These long poems (such as Homer’s Iliad and Odyssey, and Virgil’s Aeneid) were typically spoken aloud in group settings, often with some form of musical accompaniment. Writing the words with a uniform rhythm made it easier not only to recite the long poems alongside music, but also to commit the words to memory. In ancient Greece and Rome, literacy was uncommon and poetry existed primarily as an oral tradition, so being able to memorize verses was very important to the survival of storytelling. The later practice of applying different rhyme schemes to verses made the task of memorizing them for recital even easier. Together, meter and rhyme continue to be a useful tool for memorization, which is why writers of nursery rhymes, children's books, and songs have continued to write in formal verse, even as it has fallen out of popularity with many contemporary poets. Generally speaking, as literacy levels have risen over time, meter and rhyme have become less a commonly-used tool for memorization and more a way of elevating the tone of poetry and making it aesthetically beautiful so as to distinguish it from everyday language. Today, poets might choose to write a poem in formal verse for such aesthetic reasons, or to place their work directly in dialogue with a historic and rich poetic tradition—in which case the poet may choose to use a fixed form of poetry, such as the sonnet or the limerick. A long but enlightening article about formal verse that discusses the history of its usage in English poetry, gives examples, and compares it to free verse. The Wikipedia page on Poetry, which touches on formal verse and covers some of the more common verse forms, like the villanelle. For a much more in-depth look at the mechanics of formal verse, here's a 30 minute video that explains formal verse and the uses of rhyme and meter in poetry. Bergman, Bennet. "Formal Verse." LitCharts. LitCharts LLC, 22 May 2017. Web. 22 Apr 2019. Bergman, Bennet. "Formal Verse." LitCharts LLC, May 22, 2017. Retrieved April 22, 2019. https://www.litcharts.com/literary-devices-and-terms/formal-verse.